Help control drivers in dangerous, areas while protecting people and property. One person installation. Can be removed for seal coating, snow removal, or change of location. Resists marring by oil, road salt, sunlight, and chemicals. Feature dual 1"W x ¾"H cable channels and includes hardware. Constructed of lightweight recycled plastic. Compression strength is 3,200 pounds per square inch. The concrete hardware kit includes bolts, anchors, and washers. Asphalt kit includes spikes and butyl tape. The HD asphalt kit includes anchors and bolts. The HD anchor should be epoxied (epoxy not included) into the ground and then the speed bump is secured to that anchor with a bolt. 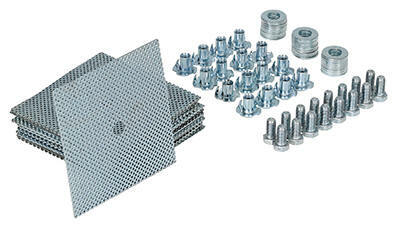 The glue down anchor plate kit includes anchor plates, T-nuts, bolts, and washers. Requires 2-3 ounces of either 2-part epoxy or heavy duty construction adhesive to the bottom of each anchor plate, which is not included. speed bumps are ready for use. The kit is available in both glue down and asphalt anchor style. Control traffic and reduce vehicle to speeds. Ideal in neighborhoods, construction areas, hospitals, post offices, and airports. Can be removed for seal coating, snow removal, or change of location. Easy tongue and groove installation. Series RSH are constructed of recycled and virgin rubber. Units are black with yellow embedded highway tape to ensure high visibility. Units include (5) center and (2) end module's. The Anchor Kits are a great addition to the facility maintenance department. 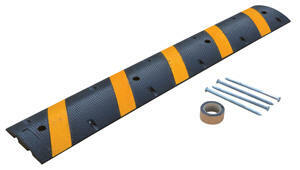 The kit supplies a solution to securing speed bumps to a surface. The unit is designed of a strong construction that is resilient and long lasting throughout the harshest environments. Once the anchoring is in place, the speed bumps are ready for use. The kit is available in both glue down and asphalt anchor style. Heavy-duty molded rubber construction for durability. Rubber includes UV stabilizer for longer life. 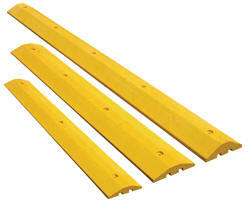 Features five reflective yellow diagonal strips and "cats eyes" per side for better visibility. Four mounting holes per speed bump with one mounting hole per end cap. Four mounting holes per speedbump with hardware included. Maximum capacity is 40,000 pounds.